Lotus plans to roll out a hybrid car at the Paris auto show that uses the modular-hybrid chassis previewed on the Evora 414E concept, shown. Lotus is preparing a high-risk concept-car blitz that will redefine its identity at this year's Paris auto show. Sources have confirmed that the sports car maker will take four all-new models to Paris, including two groundbreaking hybrids. But none of them will be on sale until at least a year and a half after the show. The first to become reality will be a modern-day Seven roadster, which could ultimately prove to be the biggest risk of them all. AutoWeek sources say it is far heavier and more comfort-oriented than the original Seven -- and it even runs such performance-sapping measures as air conditioning. The car was not conceived, designed, developed or engineered at Lotus's base in Hethel, England. Instead, the front-engine, rear-drive, open-topped car will be heavily based on a stillborn Spanish sports-car concept and might even be built in Spain. It will also be expensive; dealers are suggesting a target price of $100,000. The concept onslaught will also include the reborn Esprit. The rear-drive supercar has been an on-again, off-again project at Lotus for more than six years and was put on hold by former CEO Mike Kimberley to fast-track the Evora program, which was judged to be more urgent. The turbocharged, mid-engine V8 Esprit will be heavier than traditional Lotus supercars and will make only minimal use of materials such as carbon fiber, using bonded aluminum instead. But the big surprise at Paris -- and in production -- will be a pair of heavyweight front-engine Lotus hybrids: a four-door hatchback in the style of the Porsche Panamera and a two-door coupe, which could be further developed as a convertible at a later date. 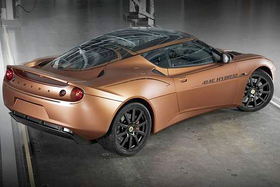 Both cars will be based on the modular-hybrid concept chassis Lotus debuted at this year's Geneva auto show for both its own Evora 414E hybrid concept and Proton's Giugiaro-designed hybrid concept. The concepts from Geneva used hybrid systems based on the Lotus-developed three-cylinder, monobloc "Omnivore" engine, specifically designed to provide energy for electric-drive series-type hybrids. In addition to this blitz, the company continues to hone its current line and debuted the Lotus Exos T125, a limited-edition race car, at Pebble Beach..